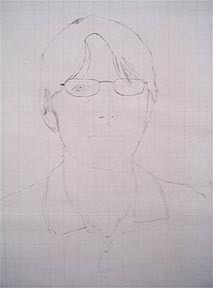 Each year following an introduction to gridded self-portraiture that includes a group "mystery portrait" project and a book & video about contemporary artist, Chuck Close, I take pictures of my Art I students with a digital camera, and print the pictures in grayscale to 8 x 10 inches. 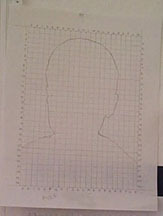 Students draw a 1/2-inch grid over the entire photograph, and then create a 1-inch grid on drawing paper to double the size of the image. 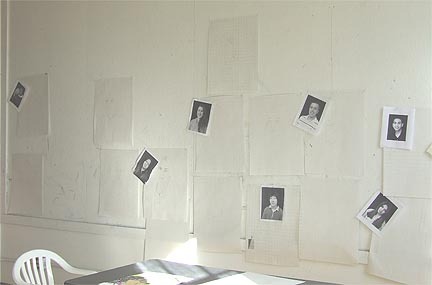 They use numbers and letters along the sides of the gridded photograph, and corresponding numbers and letters along the sides of their paper. Squares may be divided further (into quarter- and half-inches) if necessary. 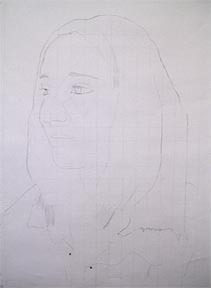 Having done this project for many years now, I've found that the students have best results if they first go square-to-square to establish the contour line around their head and shoulders, and then use the grids (like coordinates on a map) to "plot" and place their features. Most students find it helpful to use a cover sheet over their photograph to see a "row" of squares or to isolate individual squares. I encourage them to turn the photo and paper 90-degrees about every 10 minutes to facilitate their "right-brained" ability to see spatial relationships and to avoid the predictable and unavoidable "left-brained" concerns about drawing their eyes or a mouth or an ear. I tell them they're not DRAWING body parts--they're simply drawing lines! :-) They also get very tired of hearing me say, "Draw LIGHTLY!!" 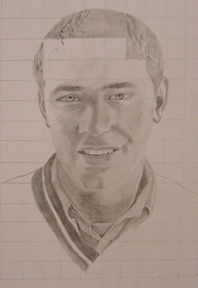 Once students establish feature placement--and VERY lightly pencil in the "edges" of shadows and differences in values--they usually erase their grid lines. 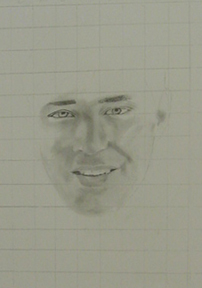 A kneaded eraser seems to work best for this. I encourage them to leave the numbered/lettered borders, just in case they need to go back and check a reference point. By this time in the year, they've had many opportunities to work with values, and I encourage them to go from "0-10" on their portraits. 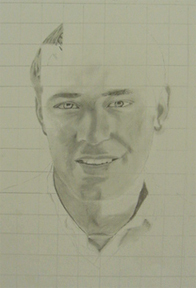 HOWEVER, when they're first adding areas of shade and shadow, I tell them to go 2-3 "values" lighter, initially. While it's pretty easy to make an area darker, it's hard to make it lighter. 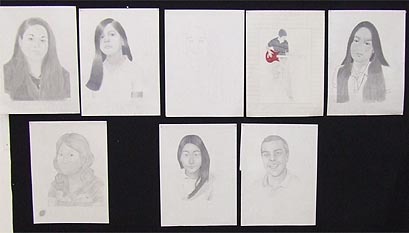 The portraits are created on 90# drawing paper using a blending/smudging technique and a regular #2 pencil. 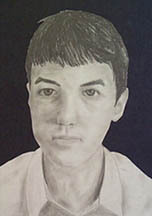 Their results are truly amazing, and most students are able to create stunning likenesses of themselves! This is absolutely one of my favorite lessons for Art I students! !